Holiday time is the busiest time of year between traveling, going to parties, seeing family, and of course gift giving. It can be stressful to shop for everyone on your list so I put together my favorite picks for this season to help you find that perfect gift--there is something here for everyone. This versatile Essie Collection tote bag is the ultimate carryall! Perfect for travel or everyday use, the beautifully-shaped tote features soft faux leather with contrast piping, and is extremely spacious. It includes an additional slouchy shoulder bag inside that can hold all your daily essentials (looks fab worn on its own as well)! The chic, two-for-one bag is well-priced and makes a perfect gift for women of all ages. Essie Collection Large Vegan Tote Bag with Piping, $140. Available in several colors. Essie Collection tote bag shown with slouchy bag inside, $140. Give this colorful and beautifully packaged Wheel of Wellness Tea Collection to anyone who is health conscious and enjoys tea time. The round gift box contains a variety of Kusmi's French wellness teas that include Detox, Boost, Euphoria, BB Detox, Be Cool, and Sweet Love. Kusmi Wheel of Wellness Tea collection - $75. Available at Dean & Deluca. Fitness enthusiasts will love this FlipBelt so they can carry all their necessities during a workout. The form-fitting belt has four pockets that comfortably hold an iPhone, keys, money and a chapstick. Available in a variety of fun colors and sizes. Perfect to wear while running, at the gym, or on hikes! FlipBelt Running and Workout Belt, $28.99. Shown in hot pink. Give the gift of a spa facial at home or on-the-go with the Clarisonic Limited Edition Mia 2 kit. In just sixty seconds, this renown beauty gadget cleans your face six times better than hands alone. The kit comes in a chic patterned travel case and is a great gift for the girl who wants to keep her skin glowing! These amazing and best-selling Kiehl's products from their famed Creme de Corps line are packaged in a festive gift box that includes the Body Moisturizer, Soy Milk and Honey Body Polish (love! ), Ultra Facial Cream, Midnight Recovery Concentrate, Ultimate Strength Hand Salve, and Lip Balm #1. Anyone with an iPhone or Samsung will appreciate getting the PhoneSuit Flex XT as a gift for the holidays to charge their "on-the-verge-of-dying" cell phones! The portable pocket tech gadget comes in three colors and will charge your phone anytime, anywhere. It can be plugged into your phone directly without using a USB wire! Buck Mason is a new American-made clothing brand committed to manufacturing casual, classic and quality threads for men. What started with the perfect t-shirt evolved into a full collection of sophisticated basics. Give your man one of their timeless oxford shirts as a gift this holiday and he will thank you! LA jewelry designer Rachel Katz is knocking it out of the park with her geometric-inspired jewelry line. This fab gold cuff is classic with an edge and can be worn with anything from jeans and a t-shirt to a cocktail dress. Music enthusiasts will love this bluetooth shower speaker by FresheTech that can play music and even answer calls and hold conversations through the built-in microphone. The compact speaker comes in five colors and has a battery time of 15 hours! 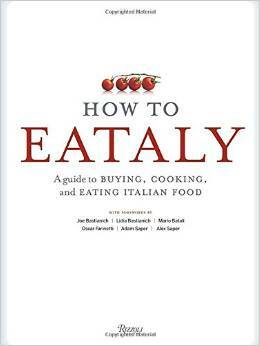 The experts at Eataly including world-famous chef Mario Batali offer their tips and tricks to cook the best Italian food with this guide. The book covers everything you need to know about Italian cooking from the ground up. Inside, you will find a list of staples to stock in your kitchen, how to find the best ingredients in your market, a variety of delicious Italian recipes and more.